Fire tornados, or 'fire whirls,' pose a powerful and essentially uncontrollable threat to life, property, and the surrounding environment in large urban and wildland fires. 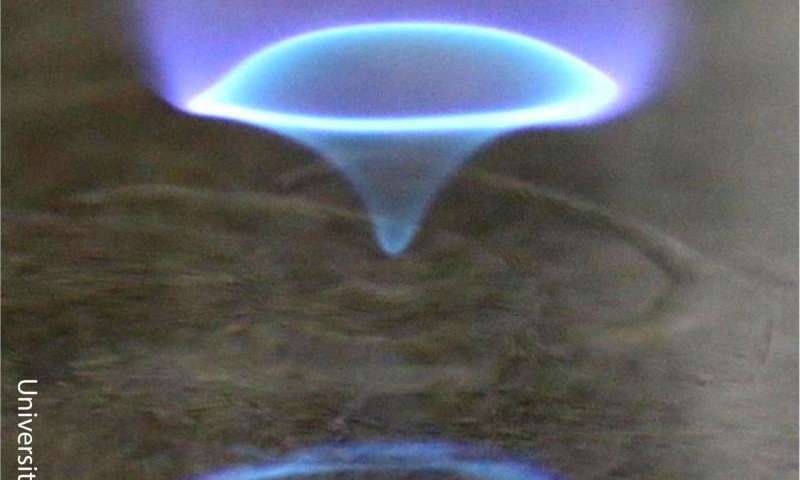 But now, a team of researchers in the A. James Clark School of Engineering at the University of Maryland (UMD) say their discovery of a type of fire tornado they call a 'blue whirl' could lead to beneficial new approaches in reduced carbon emissions and improved oil spill cleanup. "Blue whirls evolve from traditional yellow fire whirls. The yellow color is due to radiating soot particles, which form when there is not enough oxygen to burn the fuel completely," said Elaine Oran, Glenn L. Martin Institute Professor of Engineering and co-author of the paper. "Blue in the whirl indicates there is enough oxygen for complete combustion, which means less or no soot, and is therefore a cleaner burn." "A fire tornado has long been seen as this incredibly scary, destructive thing. But, like electricity, can you harness it for good? If we can understand it, then maybe we can control and use it," said Michael Gollner, assistant professor of fire protection engineering and co-author of the paper. "This is the first time fire whirls have been studied for their practical applications," Gollner added. "Fire whirls are more efficient than other forms of combustion because they produce drastically increased heating to the surface of fuels, allowing them to burn faster and more completely. In our experiments over water, we've seen how the circulation fire whirls generate also helps to pull in fuels. If we can achieve a state akin to the blue whirl at larger scale, we can further reduce airborne emissions for a much cleaner means of spill cleanup," explained Gollner. Beyond improvements to fuel efficiency and oil spill remediation, there are currently few easy methods to generate a stable vortex in the lab, so the team hopes their discovery of the 'blue swirl' can serve as a natural research platform for the future study of vortices and vortex breakdown in fluid mechanics. 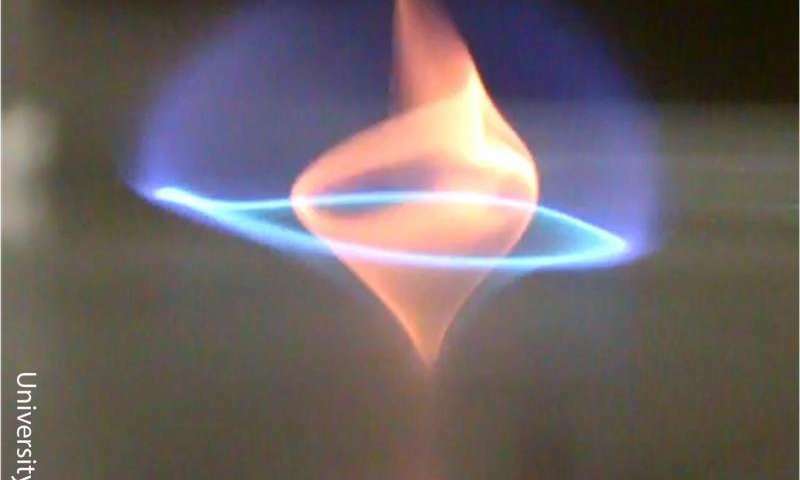 "A fire whirl is usually turbulent, but this blue whirl is very quiet and stable without visible or audible signs of turbulence," said Huahua Xiao, assistant research scientist in the Clark School's Department of Aerospace Engineering and corresponding author of the paper. "It's really a very exciting discovery that offers important possibilities both within and outside of the research lab." A fluid is a substance which flows. Plasmas flow. Plasmas are a fluid. Please do feel free to learn at least the very basics of what scientific words actually *mean* before ignorantly bashing the conclusions you draw from false premises. Too bad New Mecico hasn't authorised Santa Fe NM public bank yet then they could fund it it and save big time. Encourage your legislators. Because words and semantics are much more important than actual physics. Let us recall what happened to nuclear physics when the MHD/fluid approach was employed. Abject failure, unless of course you too have a Mr. Fusion powering your DeLorean. Could it be twirled by a rotating magnetic field, like a stepper motor minus core ?? In theory it is good to find better ways to burn oil spills, but the first goal should be to prevent such spills. The second goal should be to collect the spilled material so that it can used for profit, not just burned without any energy recovered from that burning. Then as a third and lesser option will be this burning to keep the pollution away from water, transferring it to air.